Be ready to respond if we hear of community venue being used by For Britain – Mark and others exploring and will update on Whatsapp group. Station Leafletings: Please do not post publically but share with networks. 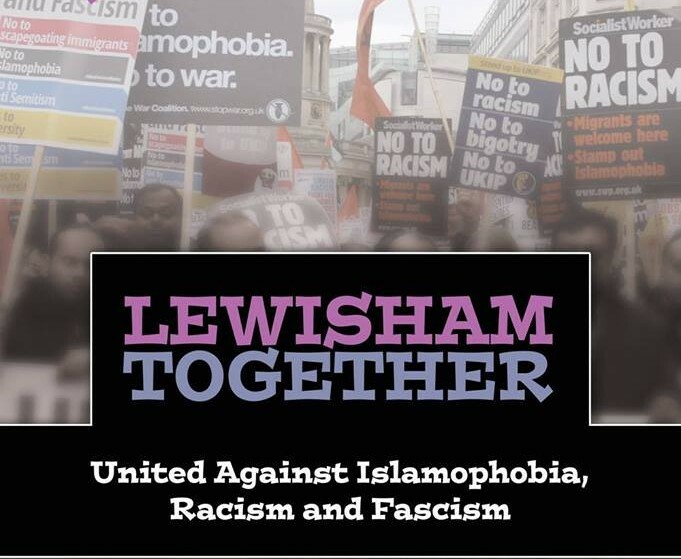 Assorted fascists racists and Islamophobes are being urged to descend on Lewisham this weekend, and the following Tuesday. They want to build their racist intervention in the local by election. Wherever these racists go, unless they are outnumbered, they hurt people. ‘For Britain’ is the paper thin political invention of Britain First’s Ann Marie Waters. She is mobilising those attending a national demonstration of the ‘Democratic Football Lads Alliance’ on Saturday in central London, a far right alliance including football hooligans and neo- Nazis, and all in support of imprisoned English Defence league EDL leader Tommy Robinson. After this group marched in Leeds recently a mosque was firebombed. They recently outnumbered anti-fascists in London. It is high time we show them they shall not pass. Racists, fascists and Islamophobes must not be appeased, they must be opposed. There is no place for them in our community. The mass community initiative Lewisham Together, Saturday 9th June in central Lewisham see poster attached, is supported by or MP Vicky Foxcroft and Lewisham Mayor Damien Egan with many unions and local councillors support. Bring your union banners! There is a campaign to ban the hustings with racist candidate, as Anne Marie Waters hopes to speak at in the Salvation Army hall in Catford, near the mosque and synagogue and in the heart of the community. The several candidates have said they refuse to share a platform (with Vicky Foxcroft MP and Damien Egan (Mayor) and many others supporting this).